Shafter is a ghost town in Presidio County, Texas. 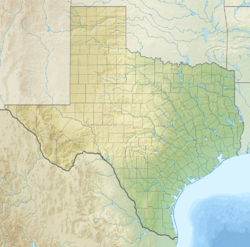 The Texas Attorney General's Office gives a population of 11 as of the 2000 Census. It was named in honor of General William R. Shafter, who at one point commanded the nearby (relatively speaking) Fort Davis. In the early 1900s, six silver mines were in operation near Shafter. When the mines closed, the town died. It was later the location for several scenes in the 1971 movie The Andromeda Strain. As of 2012, at least one silver mine, La Mina Grande, has been reopened by Aurcana Corporation. It is listed on the National Register of Historic Places as the Shafter Historic Mining District. Tucked in the Chinati Mountains on Cibolo Creek, 18 miles north of Presidio, Shafter was once a bustling mining town with a population as high as 4000, in 1940. In 1880 or 1881, John Spencer found silver deposits near this location. Capt. (later Gen.) William R. Shafter, stationed at Fort Davis and he collaborated to establish the mining operation. This operation consisted of the Cibolo Creek Mill & Mining Co. and the Presidio Mining Co., both of which were consolidated as the Presidio Mining Co. The Mina Grande orebody was producing by 1883. The ore, 30 ounces of silver per ton, was treated in a 50-ton Pan amalgamation mill. Annual production from 1898 to 1913 was 20,000 tons. In 1913, a 200-ton cyanide mill was added. Annual production from 1913 to 1926 was 84,000 tons, with 10 ounces of silver per ton. When an assay commissioned by Colonel Shafter confirmed profitable amounts of silver were in Spencer's ore samples, he brought in two of his military associates, Lt. John L. Bullis and Lt. Louis Wilhelmi, to join the venture. Each would contribute, first, by acquiring acreage around Spencer's discovery. In all, four sections of land, or 2560 acres, were acquired. Spencer and they agreed they would all share equally in profits from the venture. Then, in June 1882, lacking sufficient capital to develop the acreage on their own, the partners leased a portion of their holdings to a mining group from California which had both the money and expertise to proceed. In 1883, this group established the Presidio Mining Company, which in turn contracted with three of the partners to acquire their interests in a stock-for-land trade. Shafter, Wilhelmi, and Spencer received 5,000 shares and a bonus of $1,600 in cash to complete the trade. Bullis, asserting that his purchase money to buy the acreage had been from his wife's account, refused to join the transaction. This would later be cause for dispute. Nevertheless, development proceeded and a settlement began to grow around the mining operation. A post office opened in 1885 and took the name "Shafter" after the colonel. Company housing was provided for the miners. Company stores provided their staples and a company doctor provided medical care. The American Metal Co. of Texas acquired the property in 1926. Operations ceased from July 1930 until 1934 due to low silver prices. By 1940, the quality of the ore was 10.7 ounces of silver per ton. The recorded production of the Presidio Mine between 1883 and 1940 was 30,972,286.15 ounces of silver. Production from 1927 to 1940 alone was 11,809,163.8 ounces of silver, 5,406 ounces of gold, and 7,678,049.8 ounces of lead. At the Presidio Mine, which started operation in 1880, the Permian Cibolo limestone formation is overlain unconformably by the Presidio formation, a massive dark-grey Cretaceous limestone. The Shafter limestone rests unconformably on the Presidio formation. Ore deposits are found in the Permian limestone and consist of supergene replacement minerals argentite and cerargyrite along the bedding. Veins and replacement mineralization are present in the overlying Cretaceous beds. Lodes in the Permian limetone include Manto ore deposits and thrust fault deposits, while those in the Cretaceous rocks are steep veins along normal faults. Smaller mines have operated in the district at various times, but the Presidio remains the largest and most continuous. In the 1940s, faced with increased production costs, a shortage of miners, and an attempt to unionize those who were employed, the American Metal Company simply shut down their operation. Even so, as the businesses established there also catered to the two military bases in the county, Marfa Army Air Field and Fort D.A. Russell, Shafter continued to support a population of some 1,500. When those installations closed, however, Marfa Air Field in December 1945 and Fort Russel in 1946, Shafter went into rapid decline. Today, Shafter is home to only a few families and, over the past several decades, has registered a population ranging from 11 to 30 persons. Still, as noted above, interest and activity are renewed at Shafter. Given rising values for precious metals and modern mining and processing techniques, the little town may well live again. Occasionally, movie buffs still visit the town and take photographs in front of the church. Supreme Court Justice Antonin Scalia died at nearby Cibolo Creek Ranch on February 13, 2016. Shafter is zoned to schools in the Marfa Independent School District. ^ MacCormack, John (November 11, 2012). "Water concerns temper elation over Big Bend silver mine". Houston Chronicle. Retrieved November 12, 2012. ^ a b c Ross, Clyde (1943). Geology and Ore Deposits of the Shafter Mining District, Presidio County, Texas (USGS Bulletin 928-B ed.). Washington: US Government Printing Office. pp. 45–125. This page was last edited on 28 December 2018, at 23:29 (UTC).